Breakfast, snack, dessert….your choice! Delicious served warm or cold with a little vanilla soymilk and maple syrup drizzle. Preheat oven to 375. Coat an 8x8 baking dish with cooking spray. In a medium bowl combine oats, cinnamon, nutmeg, and salt. In a blender combine and process non-dairy milk, dates, applesauce, flaxseeds and vanilla. Add apples, raisins and wet mixture to oats and stir until well combined. Pour into prepared 8x8 pan and bake 40 minutes. Serve with non-dairy milk, if desired. If you aren't using a high-powered blender such as a Vitamix, you'll need to grind your flaxseeds (coffee grinders are great for this), or use pre-ground from the store, before adding to the blender with the other ingredients. 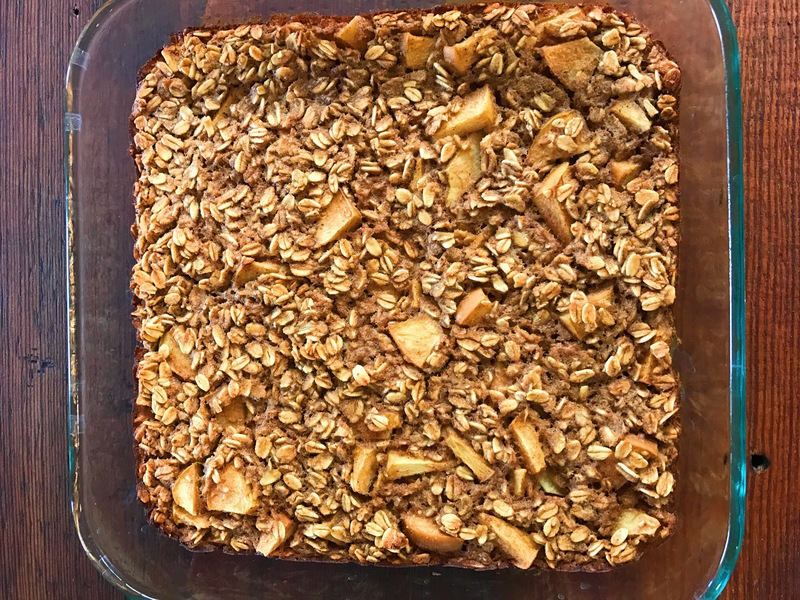 This entry was posted in Blog, Recipes and tagged apple, baked, breakfast, cinnamon, gluten-free, oatmeal, oats, vegan by Shelly Detken. Bookmark the permalink.